Rob Krar | Run S.M.A.R.T. We’re excited to announce that ultrarunning superstar Rob Krar will be our featured guest speaker at the next VDOT O2 Coaching Clinic at GU Energy Labs in Berkley, CA on August 8th. Coaches will have an opportunity to learn about Rob’s unique experience as a competitive triathlete, Division I middle distance runner and rise to the top of the ultrarunning world. In 2013 and 2014, Rob was named Ultra Runner of the Year by UltraRunning Magazine. Last year he pulled off an incredible feat winning the top 100 mile races at Western States, Leadville and Run Rabbit Run. He’s also competed in the World Championships for Canada as a triathlete. If you’re not impressed by his athletic range, while at Butler University he ran 1:51 in the 800m and 3:44 for 1500m. 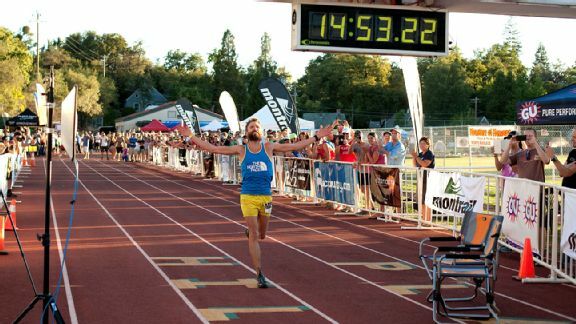 PRNewsFoto/The North Face Rob Krar nearly broke the course record while winning the 2014 Western States 100. Congrats to Rob Krar for winning the grandaddy of them all, Western States 100-mile trail race. [Full results]. Rob is on fire now. Stories here on ESPN and Outside. And here’s a great interview on Competitor. You can congratulate and celebrate with his beard here. There are an unlimited number of exercises out there but I believe these three exercises, as simple as they are, are the most beneficial combination (as a whole) to enhance and improve your trail and ultra running skills. Completing these twice a week will compliment your other strength training and running regimens nicely. Why: To prepare the quadriceps for the demands and impact of prolonged and/or steep descents and avoid the dreaded “blown quads” late in a race. As part of this new coaching partnership trail running standouts Alicia Shay and Rob Krar will be offering their expertise to all participants in a monthly private coaching arrangement. You can learn more about this unique offering here on our website.